New risk criteria which aim to transform the performance of potato late blight alert systems were revealed today (7th December) at AHDB’s Agronomists’ Conference in Peterborough. Arising from research undertaken by the James Hutton Institute and funded by AHDB Potatoes, the Hutton Criteria are a significant advancement on the 60-year old Smith Period, the current method for predicting blight pressure. Invergowrie-based PhD student Siobhán Roísín Dancey, in collaboration with supervisors Peter Skelsey (Information and Computational Sciences) and David Cooke (Cell and Molecular Sciences), examined relationships between reported outbreaks and recorded Smith Periods, and performed controlled environment experiments to determine new thresholds indicative of high blight risk. “Previously the collective reasoning was that a lowering of the temperature threshold would provide an earlier indication of blight pressure, and certainly some systems out there adjusted their operating criteria in line with this in efforts to improve the services available to growers,” said Ms Dancey. Putting the findings to the test against over 2,000 historic reports of potato late blight outbreaks, the Hutton Criteria demonstrated a significant overall improvement in performance compared to the Smith Period. “Past records revealed that the Smith Period was not performing equally well in all parts of the country, and the Hutton Criteria has eliminated this issue,” added Ms Dancey. 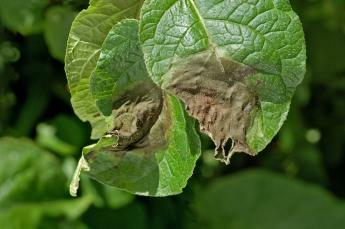 Claire Hodge, AHDB Potatoes Knowledge Exchange Manager, said: “The Smith Period has been immensely valuable in assessing blight risk to date. Originally developed by L.P. Smith in 1956, it was an improvement on the previously used system – the Beaumont Criteria. John Sarup, agronomist and specialist potato adviser for SPUD Agronomy, commented: “It’s a concern for potato growers every single year and a tool for identifying high-risk periods of disease development is crucial to help us protect our crops and give us the confidence to schedule control activities at the right time, to the right level. AHDB’s Fight Against Blight (FAB) campaign continues its free alert service for levy payers and aims to take practical advantage of the research in 2017. “The FAB tools currently allow levy-payers to register for free, automatic alerts about local conditions conducive to blight along with actual reported blight outbreaks,” Ms Hodge explained. “The plan is to build the Hutton Criteria into these systems, improve the reliability and reach of blight risk reporting, and launch them in time for the 2017 blight pressure season helping to support decisions, refine action plans and re-empower growers against blight. Images: Updated maps for Smith Period and Hutton Criteria, November 2016. Red indicates outbreaks not called and blue identifies outbreaks successfully alerted.